Poured a 330-ml bottle into a tulip glass. Appearance - copper-amber colour with a decent 1-inch head, lasting minutes, then deteriorating to a frothy-foamy-sudsy uneven 1/8-inch head. Very nice lace to show for this reduction. Smell - nothing but cream on the nose. Creamy malt, sweetness below... this worries me for a pale ale. Taste - soft malt on the palate with abundant subtle creaminess, virtually no hoppiness to speak of. Very even flavour however, perhaps a redeeming quality. Mouthfeel - although very smooth, this lacks some of the character one would expect from a pale ale. Borders on boring. Drinkability - I wouldn't get this again, or the variety 12-pack I picked up. Expensive and not really engaging... just not what the doctor ordered. Looked great, nice color and clarity. Smelt pretty good- I like more hops, but this was true to the style and the aroma hops were muted. Tasted great. Nice flavors and balance. A bit of hoppiness. All was well. Maybe it's the style that gets me. As noted, I like my hops and other pale ales have more hops so I like them better. I'd pick an IPA over a pale ale any day, and most ESBs I've had aren't especially bitter (irony!) so I like a hoppy pale ale over an extra-special bitter. Sigh. Drinking beer is such hard work! This beer is showing up more and more as the Olympics gets closer. Turns out this is what OK Springs Pale Ale should have been. A mid dark gold beer with a fresh hoppy nose this is full flavoured and has enough complexity to make it interesting. there is still a softness to it which is an old BC trademark on pale ales but it has enough hops to make me want to buy it again. Pours out a transparent copper hue, foamy white head that slowly decends leaving some sticky lacing behind it. Clean, sweet toffee malt on the nose, the hops really don't play through at all. The malt becomes somewhat grainy in the flavour, almost a dry earthy note to it all by the middle. The hops do make an apprearance now, dry and grassy. Mouthfeel is leaning towards the light side. However there is another curious phenomenon of it leaving this phantom clay-like, almost chalky texture in the mouth with the aftertaste. Not a very memorable pale ale all things considered, it certainly has its set of kinks that could use some ironing out. A pale orange with just a slight haze. A thick white head on top. More lacing that almost any of the style that I've seen. Earthy toffee sweetness and an herbal hop aroma hit the nose. Well balanced aroma. Caramel and some bitterness are noted right away, and the finish is a mix of citrus and herbal hopping. All pleasant. Nothing overpowering. Has just a hint of watery feeling, but otherwise the mouthfeel is alright. Sharp but not overdone carbonation. This is a pub beer if I've ever had one. Easy sipping, lots of balance, and overall feels light. Found this on sale at the government liquor store on Vancouver. 6 pack of cans came with a small soft sided cooler. Label claims to be "Brewed exclusively with Whistler Glacier Water". No date code visible. Yep, that picture is of my can. They have since discontinued cans, but I was able to get one for my collection. From notes taken in May. Whistler Brewing Co. is closed...long live Whistler Brewing. Whistler Brewing, est. 1989 closed sometime ago but has now supposedly been revived by a BC businessman. For a time, WBC was owned by Big Rock, but was sold off to Bruce Dean in October 2005. The bottle lists a Whistler/Vancouver postal code (but no address or phone number) and the website is just a front page with non-working links and it suggests returning after May 15/06. (The site finally started working sometime in July!) Googling Whistler Brewing resulted in the prior information, plus the intersting tidbit that although the claim on the bottle of being brewed exclusively with Whistler glacier water is true, the beer itself is brewed in Kamloops (thats about a six hour drive). This means that Dean and his associates are still using the facilities that Big Rock used for WBC before shutting down production, although a Whistler based brewery is in the works. This beer pours like a pale ale should: a nice light copper with a thick, white head. Smells is predominantly British malts, with a bit of hops. Hints of nuts, fresh bread and toffee. Taste is decent pale ale. Mostly malt, a bit of hops. Doughy, slightly acidic and sour but not bad. Nothing spectacular, but one of the better BC brews Ive tried. A little bit fizzy on the mouth, but overall very drinkable. i should have spent the extra money and bought a six pack. I look forward to trying their Export Lager. "Brewed exclusively with Whistler Glacier Water". A: Bronze, fluffy white head, great retention & lace. S: Earthy hops, grass, a little bready malt & caramel, some fruity esters. T: Earthy bitterness up front, a little orange & slightly grassy. Plenty of bitterness & a well-rouned hop profile, but it could perhaps use a little more hop flavour. Bready/biscuity malt, toffee, detectable grain, cotton-candy fruity esters. Crisp finish. M: Moderate body & carbonation. Slight acidity. I was pleasantly surprised by this quality brew. I recommend it, and I may even give the lager a try! 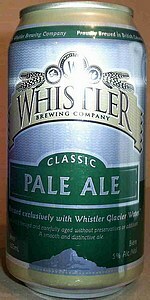 I bought a six-pack of Whistler Classic Pale Ale in a grocery store. Poured in to a pint glass. Pours a nut brown/bronze color and is clear. A moderate foamy whit head tops the brew, and leaves some dainty lace on the glass. Smell is an earthy scent, with some moss and vinegar notes. It;s a little bit acerbic and sharp. Taste is a malt flavor with a peat flavor, and an acidic bitter finish. Mouthfeel is light and clean. No cloying nature at all. A drinkable beer, and very much in keeping with the English style pale ale. If you like the English style give this a try. This was quite a surprise from a small brewery. This smells and drinks like an IPA to me. Perhaps it's just my hop sensitive PACNW palate, but this is a really hoppy pale ale. Pours just liek an IPA. Decent head, leavind rings on the glass as I drink it. The aroma is dominated by hops. Not so much malt like some APA's may have. Tastes delicious. Like a SLIGHTLY toned down IPA. Retains the hoppy bitterness, but is lower in alcohol so the associated maltiness is not necessary to balance out. Perfect carbonation leads to this being a light feeling beer. Small bubbles and no syrupiness means this is one pleasant Pale Ale. I could definately see myself buying this one again. A six pack could suffice while watching a hockey game. Great stuff. Nice bright copper brown. Decent head and lacing. Toasted malts and a hint of floral hop. Nice balance. Ditto on the taste. Tasted malts, hint of butter toffee, and enough hop bitterness to keep it from being a one trick pony. Touch watery, but all-in all a nice taste experieince. Smooth, carbontion seems to fit for the flavours. Their best beer out of the 3 or 4 I've tried hands down. A good take on the English style of Pale Ale. Appearance has a nice cloudy amber with a thick off white head with light lace. Smell of pale malts, a lite note of dark fruit and spice. Taste is lightly sweet, spicey with a cloying malt earthiness having moderate hops. Mouthfeel is light with a good spike of carbonation. Not all bad of a brew, just one I wouldn't reach for readily. Variety pk,pours a copper with orange tinge,decent tan head and nice lacing,Nose is floral,caramel,mild grass and spices.Taste is hoppy,citrus,tangy and bitter,caramel and earthy tones coming through,medium mouth,very easily to down,not a bad brew at all,well worth a try,will buy again but not the variety pk,just cause i don't care for the weisbier. On draft at Monk’s, YVR. This beer pours a clear medium amber hue, with a stingy finger of thin foamy off-white head, which fizzes away anon, leaving some spreading, actively dissipating lace around the glass. It smells of biscuity malt, some sour fruitiness, and musty grassy hops. The taste is bready, somewhat caramelized malt, a mild baker's yeastiness, and bitter earthy, weedy hops. The carbonation is moderate, a zing or two, here and there, the body medium-light in weight, and generally smooth. It finishes off-dry, the consistent malt pushed a bit more by some peppy grassy hops. A good example of a more hoppy English pale ale, even if those hops seem haphazard and muddled. Oh well, the result is a decent enough quaff, the sort better consumed without the burden of analysis, from my humble experience. Pours a hazy yellowish brown, decent creamy head with ok retention and lacing. Smells of mellow fruity malt, pineapple, apple, pear, plums, some grassy and earthy hops, . Tastes of much the same, fruity malt with a mild earthy bitterness. Finishes fairly neutral with a touch of dryness. An ok beer, i like the fruitiness of the malt, i wish there was a touch more hops to bring it together. The mouthfeel is fairly thin as well bringing down the score. pours semi-clear amber-orange with a thin beige head, and some lacing. smell of of malt, nuts, and caramel. taste is of malt, caramel, grain, a touch of corn, and some earth, ends just a little bitter. overall just okay for a pale ale could have a better look and ending. Pour: Clear medium orange-amber in color. Two fingers of white head with decent retention and some small streaks of lacing on the glass. Active carbonation. Smell: Very biscuity aroma with hints of pale malt and fruitiness. Light hop tang. Taste: Sweet pale malt front end with a hint of honey. The middle reveals a strong biscuity flavor akin to an Amber Ale. Light citrusy hop bitterness in the back. Mouthfeel: Light to medium in body with high carbonation, yet there's a certain degree of smoothness as well. Drinkability/Overall: Good flavors going on here, and very easy and smooth drinking. Very refreshing. Final Notes: This beer won't knock your socks off but it'll definitely hold its own. Great summertime beer. A - poured from a 330ml bottle into a weizen glass. It pours clear amber with a foamy white head. The lace the head leaves is quite powdery. Had this on tap at The Keg, on a recent business trip to Vancouver. Poured copper with literally zero head into a pint glass. Possible soap residue issue? Well, maybe, but given the fact that my two buddies' pints of other beers both had nice heads (that lasted), it was not a good first impression. Literally no aroma aside from basic biscuit, but this was likely compounded by the lack of head. The taste was only modestly better, with only an additional hint of nuttiness to speak of. The texture was very thin, but obviously sessionable. Maybe I'll give this a second try on my next trip. A: Modest off white head, hazelnut like color. Pretty good retention, sticky. S: Earthy notes and spicy, almost Belgian... yeast. The aroma is certainly not offensive, but lacks a strong presence. T: Sweet and biscuity malts, candi sugar, and once again a perceived Belgian yeast character which took me by surprise. Finishes with grassy/bitter hops, accented by peppery spice. Crisp and refreshing all around. M: Slightly chewy with ample carbonation. Smooth. D: Drinkability is excellent - pleasing flavors, refreshing, only 5%! Pours a clear copper color with an average white head. The aroma is mostly malt with some smokiness to it. The taste is more malt with some bitter hops in the finish. Medium-light bodied with light carbonation and a smooth mouthfeel. This beer is actually pretty good - although it could use a bit more hops. Still, its very drinkable and makes a nice session ale. A: Pours a hazy dark copper color with a very small head and no real lacing. S: Aroma or malt, nuts and a bit of dark fruit. T: Taste of roasted malt, bit of toffee and nuts. Mild bitterness and a clean finish. F: Fairly moderate body, smooth but a bit short on flavor. O: Fairly bland non-offensive English Pale Ale.